You've seen Cheryl Hayne's Chicks on the Run fabric collection; you've also seen Debby Kratovil's Technique Tuesday using the prints. Today we're sharing four more quilt patterns featuring these fun prints! The first three are quilt patterns available for purchase on Cheryl's website, and the last quilt is a free download from our website. Which is your favorite? 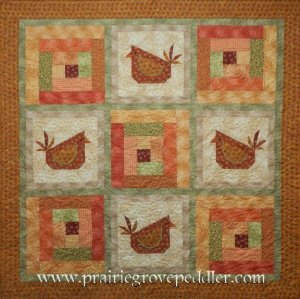 Grab some Chicks on the Run and get quilting! "In the Bird House" - I've always liked birdhouse blocks. You can add a different bird to the birdhouse and change it totally. If you look closely, you can see a line of mini poms along the bottom edge of the roof. "Cabin Fever" - I used mini poms on this quilt too--on the wings. This is the cutest quilt with those little pom poms. The chickens are pieced here; the only applique is the beak, tail feather and wing. The Log Cabin blocks are all the same design, just rotated. "Hens & Chicks" - This is my version of a soft colored baby quilt. It was fun to do! I love the check print in there (the grass, background). I think it looks so soft and sweet. The chickens are pieced, and then the flowers, beaks and tail feathers are quick fuse applique. 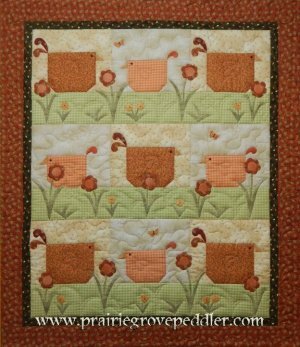 "Chicken Strips" - A rail fence variation, this is a quick and easy strip quilt! We love the stripe in the border. 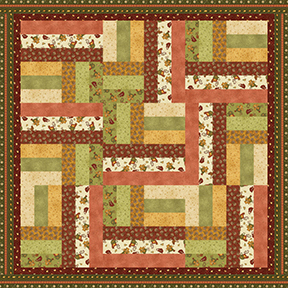 Psst...Cheryl will be demonstrating quick fuse techniques at Missouri Star Quilt Co.'s Birthday Bash September 22-24! 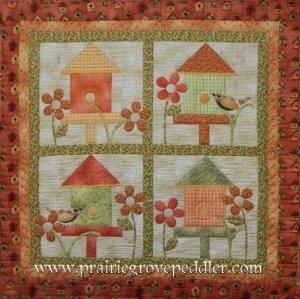 My favorite quilt shown here is "In The Bird House"! Chickens portrayed on fabrics are always so adorable, funny and delightful. Plus, I always seem to adore most Bird Houses that are created also! So bringing the two of them together is a brilliant and funtastic idea! Thank you for sharing! I am looking forward to seeing what is next. Cute projects I really like in the bird house. The naming of her quilts are hilarious.